We are so pleased to share with you that the UUS:E community was very well represented at the 13th Annual Transgender Day of Remembrance Vigil in Hartford on November 20th. More than 40 congregants braved the cold and commuter traffic to gather at the Charter Oak Cultural Center. Committed UUS:E youth allies carried the Standing on the Side of Love placard along Main Street as they led the procession of supporters to the steps of the Hartford Public Library. Rev. Josh spoke alongside Connecticut State Senator Beth Bye, LBGTQ Rights Activist Anne Stanback and featured speaker from the transgender community, Tasha Rose Lombardi. 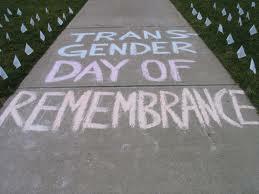 40 of the 265 transgender people brutally murdered in 2012 were named and remembered. We were proud that so many members of our congregation participated in this solemn ceremony. Following the vigil there was a moving interfaith service led by Rev. Aaron Miller at the Metropolitan Community Church and a wonderful opportunity for fellowship with members of MCC, The Universalist Church, West Hartford and the wider transgender community. This was a heartwarming example of UUS:E’s powerful commitment to living out its Welcoming Congregation promise.